Stay focused on your reading while the Quicktionary®2 Premium helps you take notes and translate your text quickly and easily! The Quicktionary 2 Premium is a portable, multi-function, hand-held scanning translator that can scan a word or a full line of text and provide immediate word-by-word translation, including idioms and phrases. The pen provides audio pronunciation of individual words or full lines of text in English. The Quicktionary®2 Premium comes with free space on its memory card for maximum flexibility. This allows you to add additional FREE dictionaries or replace installed dictionaries at your convenience. 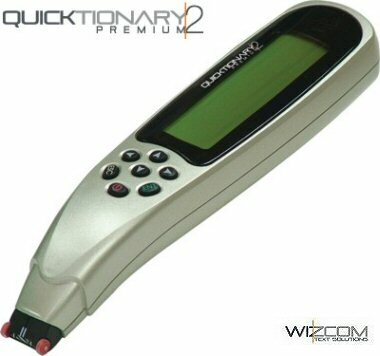 The Quicktionary®2 Premium also has the ability to scan, store and transfer up to 20,000 lines of editable text. Ideal for language students, students who need to read and/or copy texts, travelers, researchers, business people and others. Stay focused on your reading while the Quicktionary®2 Premium Translation feature helps you interpret your text quickly and easily. Take the Quicktionary®2 Premium wherever you go. This small, portable, handheld device is designed to fit in your pocket. 2 way dictionaries available are: English-English, Spanish-English, French-English, German-English, Italian-English, English-Dutch, Portuguese-English, Turkish-English, German-French, German-Spanish. 1 way dictionaries: (English to) Japanese, Chinese (Traditional and Simplified), Korean, Russian, Danish, Swedish, Finnish, Hebrew, Arabic, Czech, Slovenian, Hungarian, Polish and Greek. Size: 61mm x 20mm / 2.4" x .8"